In recent times, most people lack the zeal to work towards achieving their dreams of being successful mainly due to the fact that they are so scared to fail. 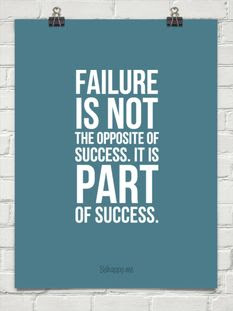 It is important to note that failure is a step to achieving brilliant successes in all you do. The following are reasons why failure should be embraced and welcomed in all you do. 1) Failure signifies that you are working to achieve something. When you have a plan to do something, maybe to perform a task and somewhere along the line you fail to achieve it, it does not mean you are a failure but it simply shows that you have started making efforts towards achieving a plan or a course. 2) Failure shows that you are about to achieve your goal. The road to success is really not as smooth as people perceive it to be, you have some stops in form of obstacles and the more you fail, the closer you are to achieving your goal. This means that you should instead of being angry and frustrated when you try to do something and you fail, it is advisable to focus on trying again keeping in mind that it only shows you are getting closer to succeeding. 3) Failure is an opportunity to learn something new on your road to success. On the road to success, it is important to note that there will be several opportunities to learn. Failure gives an opportunity to learn a lot of things, like learning to do things in different ways. It helps change your perspective on the way you could actually achieve your goals. Success is really not easy, there are no smooth roads to success as most successful people in our world today failed severally but they saw those failures as opportunities to learn and that is why they finally became successful due to all they were able to learn. 4) Failure makes you stronger. When you fail you start all over, what this does is that it makes you stronger. It also helps you to adapt to a lot of things and obstacles. It changes the way you handle situations in life especially on your way to succeeding. 5) Failure makes you to be more detailed in life. Failure helps you to focus more on areas you originally won’t ever think of focusing on, helps you to regard all aspects of your plan. It forces you to learn the act of being disciplined and detailed in all you do. 6) Failure makes you to persistent in achieving your goal. Failure makes you go back to the drawing board and try again. This helps you and teaches you to be persistent, being more determined to achieving your goals. Being persistent is a major factor that affects your level of success in most cases, the more you learn the act of being persistent the more successful you will become. Thanks for reading, please add your comments. @Steve. Thanks for your comment. I really appreciate it.